Proponents of barefoot running claim highly cushioned shoes weaken the muscles, tendons and ligaments in a runner’s feet. But imagine running outdoors in bare feet. Soles punctured by broken glass and sharp stones are a possibility. The perfect compromise for followers of this school of thought, gaining popularity worldwide, is barefoot running shoes, the most famous being the Vibram FiveFingers. Vibrams look like the feet of a huge ape, but enthusiasts swear by them. The other more famous brand is Vivo Barefoot, which entered India in November. Vivo’s shoes, like the new Evo II, actually look like shoes, but without heel cushioning or arch support. Meanwhile, Adidas has just jumped into the fray as well, with adiPure, barefoot shoes for the gym. Both the Evo II and adiPure Trainer are extremely light and flexible. The Evo II weighs 218g and the Adidas adiPure Trainer weighs 164g; the same as most smartphones. The thin sole on the Evo II gives you a great sense of the ground while you’re running, helps with balance and is superbly flexible. Though you get slightly less grip than most shoes, that’s the point—you take shorter strides and put more force on to the front of your foot, promoting better posture and exercising the muscles fully. This pair is remarkably flexible, and you can crumple it into a ball in your hand. This means that when you’re actually running, your feet don’t feel even slightly constrained. 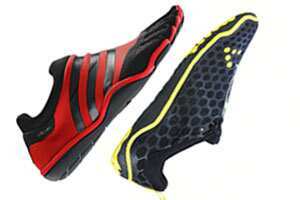 The adiPure Trainer slips on to your feet like a glove—and is designed like Vibrams, as a slip-on shoe with five toes. It’s even slimmer and lighter, but because of the low profile, this is meant for smooth surfaces and working out, not running on the track. Playing table tennis with these was a treat, with quick comfortable movements and good grip. The Evo II has an upper body made of a transparent mesh to make it more flexible, and this runs to the back of the shoe. Wearing them in the winter is uncomfortable, leaving you shivering in the cold. Heel strikes are hard and you can feel every stone you step on, though it won’t puncture the sole. This takes a lot of getting used to and is painful for the first day or two. The idea is to make you adapt to a healthier running style though. The adiPure Trainer is only useful in a limited space, though it does its job well. The shoe, which looks like a colourful second skin, is surprisingly comfortable, but looks bizarre. If you’re planning on wearing this before you get to the gym, be prepared for curious looks. The Evo IIs cost ₹ 6,850 and are available at SportXS outlets in Bangalore and Ahmedabad, and can be ordered online from www.highline.in. The adiPure Trainers cost ₹ 4,999 and are available at all Adidas outlets.